Regarded as one of the most respected designers on the market today, Oscar de la Renta has been carving an elegant silhouette in women’s wear for over sixty years. “He loves their house in Kent, Connecticut, where he’s created gardens that supply “the most spiritual and purest of joys,” and the house in Punta Cana, Dominican Republic, where he has built an orphanage and day care center that serves more than 1,200 children. Óscar Arístides Ortiz Renta Fiallo (he changed his name to the more aspirational “de la Renta” later) was born to a Dominican mother and Puerto Rican father in Santo Domingo in the Dominican Republic in 1932, and raised – the only son with six sisters – in a world filled with intellectuals, artists and politicians. The groundwork for Oscar’s future as the designer for society’s elite was set. Moving to Madrid in Spain at the age of 18 and leaving his mother who was suffering (and later died, not having seen him again) from multiple sclerosis, he studied painting at the Academy of San Fernando – alumni include Pablo Picasso and Salvador Dalí. He soon found himself illustrating for some of the biggest fashion houses in Spain to help pay the bills and prove to his father than he could make a living, as well as dancing up a storm. His passion for art and design, and illustrious social connections enabled him to work as an apprentice with Spain’s most famous designer, Cristóbal Balenciaga (1895–1972) in Madrid, and later as an assistant to Antonio Castillo (1908–1984) at Lanvin in Paris. The experience of working with fabrics, designs and techniques, as well as his advantageous friendship with a wealthy and well-connected Estonian-born baroness and two-time divorcée named Aino de Bodisco, opened the opportunity for him to live in rent-free luxury. magazine in a debutante gown made by de la Renta. The years spent at Balenciaga and Lanvin assisted in defining the beautiful, feminine and elegant style he is now, so famously, known for. With the lessons of two of design’s best teachers under his belt, he gained further international fame in the 1960s as a couturier to Jacqueline Kennedy, and in the 1980s with Nancy Reagan. His popularity with presidential wives continues today, including the dressing two consecutive First Ladies, Hillary Clinton in the 1990s, and Laura Bush in the 2000s, including outfits for their husband’s respective Inauguration Day. He has not, however, dressed current presidential wife, Michelle Obama, and has made some inflammatory statements about this – read more here – but he did dress Ann Romney, wife of presidential nominee, Mitt Romney, in a stunning red shirtdress during the 2012 campaign. During his time with the grand couturiers, he saw the huge potential of designing ready-to-wear garments. After receiving an offer from Christian Dior, he sought career advice in 1963 from the new editor-in-chief of Vogue who had been at Harper’s Bazaar from 1936–1962, the legendary Diana Vreeland (1903–1989), and mutual friend of the Vicomtesse Jacqueline de Ribes. He didn’t disappoint, taking her advice and moving to America, and being strategically seated next to Ms Arden at a ball by his friend and New York socialite, performing arts and public relations agent, and novelist Count Lanfranco Rasponi. De la Renta went on to charm the beauty entrepreneur – “Oscar has quite a way with the ladies,” journalist Eugenia Sheppard recounted later – and proceeded to join Elizabeth Arden (1884–1966) on her couture range, working for Arden for two years. While more known for her beauty line, Arden joined de la Renta’s name to her fashion line to gain more publicity. Being included in Vogue in October 1964, with photos by the iconic Helmut Newton, and receiving support of Vreeland was clearly a major advantage. “I design clothes for women to wear. I am not interested in shock tactics. I just want to make beautiful clothes.” he told the “Palm Beach Daily News” in 1963. This helped him form a more distinct profile of his own, and in 1965 he went to work for Jane Derby (1895–1965), an American ready-to-wear fashion designer since the 1930s, where he took a 33% stake in the company. When Derby died in August of that year, he took over, at first using the label “Oscar de la Renta for Jane Derby” but changing it to his name on 1966. In 1974, he took full control of the Jane Derby business, incorporating it to the Oscar de la Renta brand. Life in the social world’s elite advanced for Oscar when he became the third husband of Françoise de Langlade in 1967. Françoise (1921–1983) was the editor of French Vogue, joining the magazine in 1951 after a stint at Harper’s Bazaar. She was also a famed hostess, and once worked for the fashion house of Elsa Schiaparelli (1890–1973). She had been a mistress of Baron Elie de Rothschild, and married firstly to French businessman Jean Bruère, and secondly, diplomat Nicholas Bagenow. She moved to New York to live with her new husband, Oscar, joining American Vogue in 1968, where she was editor-at-large, as well as a short period as fashion and beauty editor at Elizabeth Arden International, and she also held an editorial role for House & Garden magazine. Their dinner parties – in their homes in Manhattan, Connecticut and the Dominican Republic – were legendary, mixing old and new money with fashion, entertainment and politics. She died of cancer, aged 62, in 1983, survived by her husband, Oscar, and son Jean Marc Bruere, from her first marriage to Jean Bruere, a French businessman. Read her obituary in the New York Times. In December 1989, he married his second wife, Anne Frances Mannheimer Engelhard Reed (born 1939) – known as Annette – an American philanthropist and socialite, and member of the International Best Dressed List Hall of Fame. Annette’s mother, Marie Antoinette Jeanne Reiss but always known as Jane (1917–2004) had been born in Shanghai to German-Jewish father and Californian-Catholic mother, and raised in Shanghai and Paris. At 21, she was only married to a Dutch-German banker and art collector, Fritz Mannheimer (1890–1939) for two months before he died suddenly, leaving her pregnant with Annette. The widowed Jane Mannheimer moved several times after Annette was born, including to London, Buenos Aires and New York. In 1947, she married again, to billionaire American industrialist Charles Engelhard Jr (1917–1971). According to some sources, the fictional character of Auric Goldfinger in the Ian Fleming’s Bond novel Goldfinger, was based on Engelhard, who was a friend of Fleming’s. They set up several homes for the family including New Jersey, New York, Nantucket and Maine in the US, as well as South Africa, London, Paris, and Quebec. The Engelhards had four daughters together, and Annette was officially adopted by her step-father, taking on his surname. In 1960, at the age of 21, Annette Mannheimer Engelhard married her first husband, the financier Samuel Pryor Reed (1934-2005), a vice president of Engelhard Industries, the family company. They had three children: Beatrice Reed Morrison Niven Phelps, Eliza Reed Bolen, and Charles Reed. Beatrice went on to marry three times, to Roger Morrison, David Niven Jr (son of actor David Niven), and David Phelps; Eliza married Alex Bolden; and Charles married Natalie Witgosky. When the Reeds divorced in 1967, Samuel distributed his fortune to their children to ensure Annette got only 15% of their joint estate. When Annette Engelhard Reed married Oscar in 1989, she became Annette de la Renta, and his family not only increased but so did their input into the business. He now had stepchildren from his marriages to both Françoise (a son, Jean Marc Bruere) and Annette’s three Reed children (Beatrice, Eliza and Charles), and his own son, Moises de la Renta, who he adopted in 1984 shortly after Françoise’s death. Today, his step-daughter Eliza Bolen serves as Vice President of Licensing at Oscar de la Renta, and son-in-law Alex Bolen is the brand’s Chief Executive Officer. Read more about this via New York Magazine article from 2005. Annette de la Renta has been in the news since 2006, coming to the defence of her friend and New York society icon, Brooke Astor (1902–2007). It has been alleged that Mrs Astor was abused and financially exploited by her son Anthony Marshall. Despite Astor’s death aged 105 in 2007, Annette has continued to fight the legal battle over her estate. In addition to numerous philanthropic activities, Annette is a trustee at the Metropolitan Museum of Art and has served on the boards of the New York Public Library, Morgan Library and Museum, Animal Medical Center, the Charles Engelhard Foundation and Rockefeller University. From the 1970s onwards, Oscar de la Renta continued to extend his business to include fragrances (1977), accessories (2001) and homewares (2002). The brand now includes a high end sportswear collection (OSCAR by Oscar de la Renta), cosmetic cases, eyewear, furs, jewelry, lingerie, scarves, sleepwear, and swimwear, as well some menswear through a licensing arrangement. Oscar de la Renta has not limited his creativity to fashion, beauty and homewares. 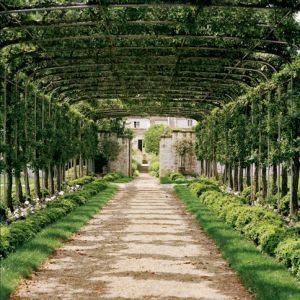 In June 2001, he created a garden for Lord Jacob Rothschild at Waddesdon Manor, the turreted French château-style home built for the Rothschild family in Buckinghamshire, England. Read more about it here. In 2002, he created uniforms for the Dominican Republic’s police force. And in October 2004, Oscar de la Renta collaborated with the Duchess of Devonshire on the Chatsworth furniture collection for Century. The new business venture encompassed 100 home furnishings for Century Furniture including dining tables, upholstered chairs, and couches. He has also had collaborations with other fabulous designers such as this tableware collection with Miles Redd, below. In addition, he became busy in 2006 designing and co-owning a resort, Tortuga Bay in Punta Cana, in his home country of the Dominican Republic. See the post and photos of the Dominican Republic resort here, and his own home nearby here. In particular, he has developed his evening gowns range, making his dresses a must for America’s society princesses, and in 2006, brand further diversified into bridal wear. From 1993 to 2002, de la Renta designed the haute couture collection for Balmain, the fashion house famous for its classic, luxurious style, founded by fashion and costume designer Pierre Balmain (1914–1982). With son-in-law Alex Bolen as CEO, the brand saw significant international wholesale growth from 2003, moving from five to seventy five locations, as well as online. Oscar de la Renta is universally adored by the social set, royalty, political wives, and celebrities. Marina Rust) look on. Photo by Annie Leibovitz, September 2000. Lifetime Achievement Award from the Hispanic Heritage Society and Grand Marshall of New York City’s Hispanic Day Parade. Thanks to the popularity of his label and his ongoing success, in 1982, Oscar de la Renta was able to open an orphanage in La Romana called ‘La Casa del Niño’ and helped build a school near his Dominican Republic home in Punta Cana, enabling him to give back to the community and people from which he came and made him who he is. In addition, he is a board member of the Metropolitan Opera Association, Carnegie Hall, the Queen Sofia Spanish Institute, and New Yorkers for Children, as well as a two-time president of the Council of Fashion Designers of America (CFDA). Read more about Oscar de la Renta via Wikipedia and his website. See our Oscar de La Renta photo gallery. “I don’t really know how to do casual clothes,” Oscar de la Renta once told Women’s Wear Daily. This entry was posted in Uncategorized and tagged Balenciaga, fashion designers.